Want to learn how to trade? 3 free online stock market contest websites you should check out! Forget paper trading! One of the best ways to learn how the stock market works, and to see if you have what it takes to become a successful trader, is to join a stock market contest. Essentially, with a set amount of virtual cash in the beginning of each game you can start building your stock portfolio. There are several free stock market contests to choose from, some are better than others - depending what you want to learn. Use the following virtual stock exchanges to your advantage and learn to trade the stock market! I listed the best ones you should check out. The first one is the stock market contest simulator from Market Watch. 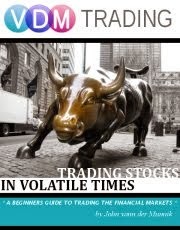 VSE (Virtual Stock Exchange) Market Watch lets you trade stocks in real time with your virtual portfolio. It has an extensive discussion group where you can discuss trading strategies with other traders. You are also able to create your own (private) game or join stock market games that are already running by others. There's two difficulty levels: Normal and Advanced, although the only difference between these difficulty levels is that advanced mode allows you to place Limit and Stop Loss orders, as well as trading partial shares. If you decide to join a stock trading contest from Market Watch, choose an Advanced game, it's not 'more difficult', it just has more options. All symbols can be traded, although you can also specify your own symbols as you can see in the 'Create a Game' screen below. Create a game screen from Market Watch stock market game. Below are the current settings for the VDM Trading 2013 game contest that will run until the end of 2013. As you can see, plenty of choices. Options are unfortunately not supported, but keep on reading if you are looking for a contest that supports option trading. For more information, visit http://www.marketwatch.com/game/ to create your own game, or join VDM Trading's 2013 game below by simply clicking the JOIN NOW! button. The second one is the contest simulator of Investopedia, my personal favorite due to the fact that it supports options trading - something that's hard to find in a stock simulator. 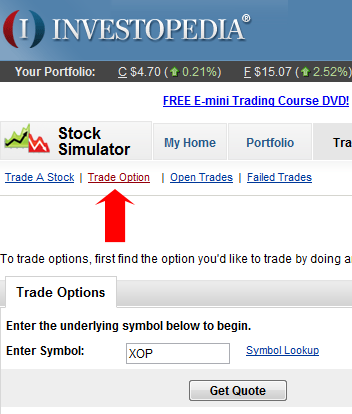 Investopedia's stock market contest simulator supports options trading. The only problem with Investopedia's simulator is that their quotes are delayed for 15 minutes, which is not the case with Market Watch (above) that supports real time quotes. If you're looking for a stock market contest that is mainly about plain stock market trading and not so much about options trading, I recommend Market Watch. Also, with Investopedia, you can customize your own stock market contest game. Create your own stock trading contest or join others at Investopedia! The third one I would like to mention is one of the first ones to offer free online stock market contests, a website called; How The Market Works - profound isn't it? Its stock market exchange contests are robust though, and easy to understand. How The Market Works.com is unique in its own way. The reason for this is that it now also supports Forex trading and penny stock trading, something that's not possible with the ones mentioned before. It's free to join and you can create your own contest along with its rules and regulations. How The Market Works User Interface. HTMW also supports forex and penny stock trading! For more information about the contests of How The Market Works and to create your own contest click here. There's a handful of other free stock market contest websites out there, but I listed the ones that I think are the most educational and easy to use if you want to learn how to trade. If there are any out there that you think should be added to this list, feel free to comment.